My wife bought a new Honda Jazz in November 2017 (plated 11/17 & MY18) with an in dash GPS, which was a major a reason for buying that model. We expected that a new car would have a current GPS map installed. Not so. After discovering numerous unpleasant instances, such as not recognising the local M1 motorway, and getting run around in circles, and not finding local roads in our town of Gympie, we discovered that the GPS was by TomTom and dated September 2016. 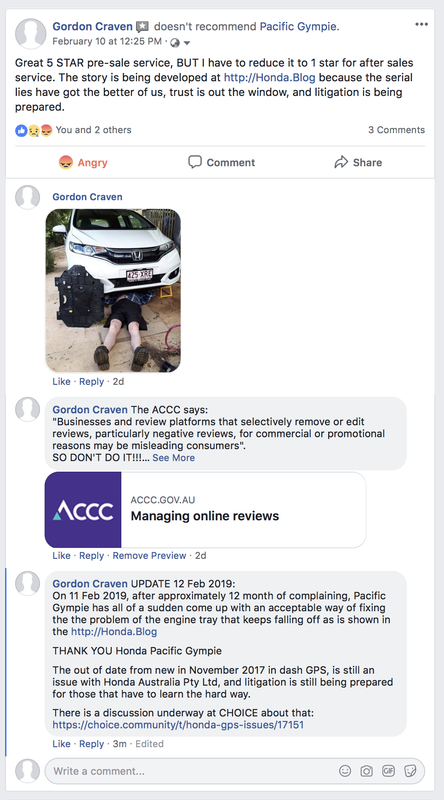 Since purchasing the car up until now (Feb 2019), we have had so many lies from Honda Australia and the local Honda dealer, our frustration (along with another complaint) has led to purchasing the domain and publishing the HONDA BLOG. Also the matter is to be filed with QCAT under breach of warranty, breach of common law contract and contravention of Australian Consumer Law. Some morons just have to learn the hard way. Your Blog should get their attention. What about going to the media,eg, A Current Affair of the Today Tonight? Many auto manufacturers only have updated maps annually so a 2016 map in a 2017 delivery could have been the most current. They sell updates as if they are auto parts at $350 each even though one can buy a portable GPS for half that with ‘lifetime’ updates (OK, generally 5 years or more = lifetime). The missing roads would be a function of the digital database Tomtom uses. If an area is wrong they cannot just push a button or ring down the hall to fix it. Who Licenses Maps to TomTom & Garmin? What precisely are you asking from that action? Your best answer may not be palatable, but consider demanding a refund for the GPS and an amount for diminished vehicle value if they cannot deliver a map including your area, and buy a portable with ‘lifetime’ maps, or use a mobile map app. nb. I have not seen a ‘factory’ GPS that displays current speed, probably a liability issue. Do any of them show it? The HONDA BLOG has got their attention in Gympie plus in Melbourne where Honda Australia Pty Ltd resides. The issue of the engine tray falling off, (as per the HONDA BLOG) is to be fixed by a suitable fixing solution they have provided today, by photographic evidence. This is after about 12 months of complaining. The Gympie agent still says that they have not received a GPS update, and they wish me to believe (which I don’t believe) that September 2016 is good for 2019, which it isn’t. Honda Australia Pty Ltd stated in writing back around June last year, that they would install an update by October 2018 which was accepted as being the relief required. However it has not happened, and I just can’t believe that new Honda vehicles are all being released with September 2016 software. So the relief that we will be seeking from Honda Australia, is a declaration that Honda Australia is in breach of its warranty, in breach of its October 2018 offer, and in breach of ACL, in that the GPS is not fit for purpose and Honda is failing to provide the software (as in parts) that should be part of its requirement to sell vehicles in Australia. So if we get the declarations, we can look at getting an order for rectification, otherwise damages if they are are too useless to fix it, or get the software from their supplier. I am interest in this sort of stuff, and have registered “lemonlaw.com.au” in anticipation of it becoming law throughout Australia. No website there yet. You must be a very patient person @gordonc. It sounds like you have a good handle on dealing with this and please let us know how you go with the site/situation as it progresses. If any other readers are experiencing Honda map update issues, please leave a comment below. My Suzuki Baleno GLX uses the Bosch sat nav system . It uses an SD card . I purchased the car in 2017 and it had a 2015 SD card with maps fitted . It was already 2 years out of date . I enquired this week about updating the system but the SD card is dated 2017 . I phoned the dealer and he advised they were always 2 years behind. The price of the new SD card with maps is $139 +$6.50 postage . I wont worry for the time being . My wife’s Mazda has a similar problem. It came with a none too up to date map set for its GPS. The updates last time I checked cost upwards of twice the price of a good aftermarket GPS. These aftermarket devices have lifetime maps and a regular upgrade scheme unlike the one off offered by Mazda. There is certainly a case for cars coming with free,up to date, upgrades at least during the warranty period and an upgrade at actual cost scheme thereafter. You can update my Subaru Liberty’s system on line (for $169 incl GST -> http://subarumapupdates.com.au). If you live in North America or Europe, the updates are free -> http://www.subarumapupdates.com/index-en-gb.html. 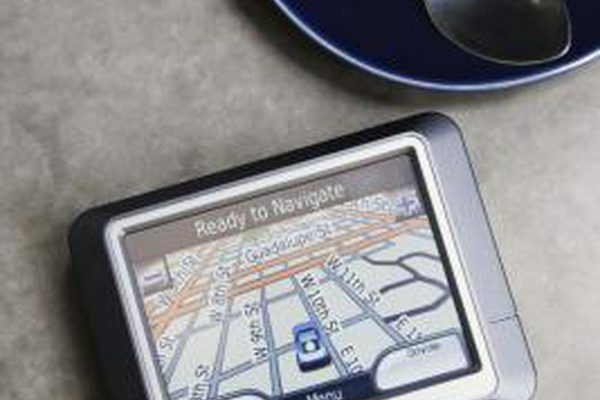 An increasing number of new vehicles no longer come with in-built GPS. They have Apple Carplay and AndroidAuto that cast mobile phone GPS apps onto their media displays. None of that helps the dinosaur ‘old school’ rips, but. I went to Apple CarPlay and Android Auto and updated my brain. I didn’t know this technology existed. It would seem to be the best way for the future of in dash displays and perhaps why Honda and other manufactures are not bothering much with updating maps. Doesn’t get them off the hook though, as they are locked in to what they sold consumers. It might be cheaper purchasing a small tablet with GPS, loading in one of the GPS/mapping/navigation apps with the sole purpose of using for in car navigation. We test GPS systems and apps in the CHOICE labs, including units from TomTom, Garmin, Navman and apps from Apple and Google. Thanks for the info Pete . I actually have a Garmin GPS unit circa 2011 model NUVI 2360 LT . Before Suzuki had a built in Sat Nav they would throw in a Nav Man , Tom Tom or Garmin when youpurchased a vehicle . I was lucky to have been supplied a Garmin as it has the SUNA traffic system and a menu showing the actually speed of the vehicle . Not to be confused with the road sign speed . I can’t find this on the Nav Mans I have . Might be there not sure . . When you are in an 80 zone the Garmin will read 75KPH actual speed. Speedos since 2005 must read 6-8% higher than speed travelled . Where the Garmin really shines is in my pre 2005 Van . At 100KPH on the speedo it is actually doing 108KPH . Speed ticket territory . The Garmin allows me to stay within the limits . Voice activation is easier on the Garmin too . I just say ’ Voice Command" whilst driving to access the voice menus . On the Bosch system in the Suzuki Baleno I have to press an icon on the in dash mounted screen to put it into voice mode . Means a brief look away from road . The Garmin is a 2011 model I hope it lasts forever ??? That should brighten up their Monday morning. I bought a Honda Accord Euro in Sept 2006 in Canberra. Its inbuilt GPS had no clue as to where I lived; it was off the map. The DVD was dated 2004. I complained to the local dealer which was servicing the vehicle at the time, and they supplied me a new (current) DVD at cost price, which was still exorbitant (IMHO) although it was almost half the RRP! After that the maps became outdated within a few years, but I resisted paying the ludicrous update price. I now have a Hyundai with Apple Car Play and have no complaints or costs in relation to GPS mapping. While obvious once it happens, when out of mobile coverage some GPS apps ‘go missing’ unless one has the forethought or prompting to (pre)load offline maps; GPS hardware products always have maps loaded so only depend on the GPS sat constellation. Reality is you have accepted costs through your mobile data plan, any related apps costs, and so on. It is usually a very small fraction of the cost of a built-in, and a fraction of a portable, but is not $0 unless you have such a generous plan it is inconsequential no matter how much you use it.